The priest’s low voice resounded through the worship hall. Asyut, with his eyes slightly lowered, focused his ears on the recitation of the scripture. They were already words of prayer that he had memorized word for word without errors, but right now to Asyut they only resounded exceedingly emptily. Asyut just kept silent and hung his head, not moving like a stone statue. The priest’s words paused and the place was enveloped in a serene air. The sunlight that came in from the large windows covered Asyut’s closed eyes. It was a painful silence. Eventually, when he opened his eyes, the large altar decorated with elaborate craftsmanship leapt into his vision. Asyut looked up at it, unaffected by its overwhelming appearance. Next to him, there is no form of the girl who had always accompanied him in this ceremony during the past year. He was still not accustomed to kneeling in front of the altar all alone like this. Asyut glanced at the spot beside him, only moving his eyes. The chair, which had lost its owner, appeared somewhat lonely. No, perhaps the one who was lonely was he himself–. The Ceremony of Worship soon ended. Asyut stepped back to the side of the altar and sighed without notice. Nearly fifty of the country’s statesmen, who had been offering similar prayers, behind him began to the leave the building in their own direction. As Asyut watched their backs, he idly wondered how long this ceremony could continue. Among the people who were standing up from their seats at their own pace, there was one person who didn’t move and continued to offer prayers in his seat. The elderly man garbed in priest robes and with hair that was streaked gray was one of the high priests, Roblin. Even he, who normally frightened his surroundings with his spread out aura of intimidation, was merely a devout follower when he kneeled in front of God to pray. At last, seeing the moment he raised his head, Asyut walked up to him from the side of the altar. He called out in a quiet voice. There was already the usual deep wrinkles carved into Roblin’s brows when the man looked at him. It was a voice that did not hide his displeasure. However, Asyut did not waver. Roblin said that over his shoulder and stood up. Asyut stood in Roblin’s way to block his path of retreat. Roblin scolded him in a noticeably low voice. Asyut’s brows furrowed at the words that were returned lightning-quick. Roblin glared at Asyut with eyes that seemed to burn. His tightly clenched fists trembled faintly. Asyut chided him in a quiet tone. Apparently, Roblin seemed to think that the events related to Celiastina in this past year were all traps devised by the king. In fact, about this matter, the royal palace was secretly swallowed by a whirlpool of confusion. From the day it was known throughout the castle that in this past year the saint shown in front of everyone was a fake and that the real Saint Celiastina was taken away by the priests to the Priest Tower, the discord between the king’s faction and the priest faction only deepened more and more. There was the king’s faction which wanted to prune the influence of the priests, and the priest faction which strongly opposed that. There were no signs of compromising between either of them. To begin with, King Ronbarno had been aiming to weaken the priest faction and laid the foundations for a long, long time. Even leaving the selfish and brutally acting Saint Celiastina unregulated was nothing other than him thinking to expose in broad daylight the dangers of the being called a “saint” and, in addition, “religion” itself having authority and power. It is not a person chosen by God, but a person chosen by the people, who should be suited to standing at the head of people– he wanted to make this known to everyone. It must have been good fortune to the king for a single girl to suddenly appear there in the royal palace with an appearance similar to Celiastina with no difference. The king certainly used her. Roblin was surely the type that was stubborn about his suspicions. However, with Roblin, he was not going to simply stay silent and let the king go. Even now, he understood clearly the fact that everything was already going according to the king’s will. And it is on keeping this in mind that he took a reckless action to confine Celiastina in the tower. He was waiting for the time. For the moment he could grab the tail of the king’s “conspiracy”–. The time allowed to the priests was this moment only when the king was showing an attitude of tolerance. The king could start to do something at any time. If he decided to completely discard the priests then he would not hesitate to even lead the soldiers to invade the Priest Tower, said to be consecrated ground. Roblin continued speaking with a strong tone. He had no objection to Roblin’s words. However, there was a large misunderstanding. The one matter of the imposter saint was not an event arranged by King Ronbarno. He only used it well. Even the king could not grasp her whereabouts. Nobody– knew where that girl had gone. The girl called Yuna disappeared unexpectedly from the royal palace. If her words when she had left were everything, then Yuna no longer existed in this world. She was an illusionary girl who had already died one year ago. No matter how much Roblin yelled and shouted, she would never appear again. –I wish to go and save that girl. Asyut, who had been immersed in his own thoughts unawares, raised his lowered gaze at Roblin’s utterance. Asyut knew well that this condition was basically meaningless. The reason why was because the king had no interest at all in responding to Roblin’s dealings. It was convenient for him to have the imposter saint remain gone like this. Even now the king, while publically conducting a search for the imposter saint who suddenly disappeared, continued to give non-commital responses to the surrounding voices of doubt. If the priest faction began pursuing the matter related to the imposter saint in earnest, the king only needed to crush them without question. From the start, there was no chess piece in Roblin’s hands. Asyut stared firmly at Roblin. Even if the king was to try and discard Yuna, Asyut himself would not give up. He couldn’t lost sight of the faint light he saw in his despair. Find Yuna who had disappeared. Asyut responded in an unwavering voice. That resolution had already been made from the instant he lost her in front of the asiatic jasmine. Siegcrest was waiting to the side of the exit after Asyut left the worship hall. He straightened his back from leaning it against the white wall, wearing his squad’s uniform as messily as usual, and pestered Asyut with that question. Bothersome old men, Siegcrest muttered in disgust as he started to walk. Those words from Siegcrest could be said to speak for the feelings of the entire royal palace right now. From the uprising of the anti-saint faction, everything passed by in a rush, and now everything was vague. Asyut murmured this in a small lost voice that surprised even himself. Siegcrest, who stopped and turned back, looked at Asyut with an expression that seemed somewhat displeased. Siegcrest asked back without trying to conceal his annoyance. Siegcrest stated that easily in a way that was completely like him. As he said this Siegcrest poked Asyut’s shoulder. It’ll be okay, Siegcrest repeated. Yuna disappearing and Celiastina returning didn’t mean that everything would go back to how it was originally. Asyut thought that he was saved by Siegcrest’s words. Siegcrest shrugged his shoulders as they started to walk down the long corridor again. Asyut denied that in a flash. By this time, the members of the anti-saint faction who had revolted were all liberated already by the pardon of the king. Originally, they should have been sentenced to death on the crime of opposing the king and saint. Naturally, even in the royal palace the liberation of anti-saint faction members was divided into people for and against it. The priests, above all, strongly objected to it. To point a blade at the saint was the same as harming God. The priests insisted strongly that the anti-saint faction must compensate for their crimes with capital punishment. However, in reality, that these events were made out to be a “moving tale” in and of itself was certainly the most frightening thing of all to them. It was extremely inconvenient for the priests to have the saint’s tyranny up to now exposed to the public and to approve the anti-saint faction fighting against that at long last. And their concerns were also very reasonable. However, it would not be an exaggeration to say that this was precisely why the king decided to pardon the anti-saint faction. Asyut, who had served by the side of the king for a long time, felt like he could pick up and understand the king’s expectations. More to say, Roblin and others like him had already given up on this matter as hopeless and were trying to grasp onto a more effective “trump card”. Siegcrest blinked his eyes at the words Asyut released without delay. Siegcrest shrugged his shoulders in a large motion. Siegcrest didn’t press deeply when Asyut prevaricated his words. An unproductive battle. Unable to hide his displeasure at last, Siegcrest glared at the sky with half-closed eyes. He understood well what Siegcrest was saying. It was a sound argument, painfully so. Everyone was trying to use that girl– Yuna, for their own selfish convenience and wanting to take her out to the center stage again. It was the same with Asyut. Because he wanted to see her, he didn’t want the days she spent here to become an illusion, and that selfish desire was even now about to make him move. Siegcrest’s words echoed strongly in his mind. At that moment, the voice of a young man broke in between the two of them. Siegcrest, who looked like he was going to encroach even more on Asyut, turned around and looked as if he were given the dodge. The owner of the voice was a member of the Order of Knights. He looked to be flustered as he ran over to them. Siegcrest, who switched his frame of mind instantly, went to leave but also threw his gaze at Asyut who stood still on the spot. Siegcrest hit Asyut on the arm lightly and then rushed down the corridor behind his subordinate. It was only after he saw that back become small that Asyut left that spot. Asyut bit his lip strongly. He knew that. But he couldn’t deny that he tried not to think about that. Even if he was able to get back Yuna, what did he want to do after that? There was the him who was the First Holy Knight, and then the him who was nobody. Whenever he tried to think on it, his thoughts would always come to stop. Asyut stopped moving again and looked out the window from the corridor. What he saw was the brown wall of the building beside him and the tall trees that dotted the garden. It was a landscape that was none the better for the change. However, in Asyut’s mind, the back of a girl standing there in a flower field of full blooms appeared. The season when the torch bugs would emit their beautiful lights was arriving soon. Aw, thank you for saying that and giving this a read! I’m a bit embarrassed looking back on the very first volume because the translations feel so clunky there, haha. In this year I’d like to think I improved a lot though and the latest ones read much better :’). Heehee, since volume 4 is still an entire volume by itself it has to have its own conflicts |D but I think you’ll get a chunk of answers in Ch3, which is fortunately a manageable length and I should be able to get that out soon! i wonder how the author’s going to wrap this up. How is yuna going to come back?? You’re welcome!! Heehee, we’ll just have to wait and see :D.
Thanks for the chapter! It makes me happy that we are on final volume. I wonder if Yuna will show up at the palace again, highly unlikely for her to take center stage for political reasons. SAME! It’s been a long long journey LOL but I’ve learnt a lot about translating prose through this journey and it’s always great to see familiar faces in the comments, so thanks for sticking with me (and my slow updates, oops). :)))) Asyut is certainly torn about that. As always thanks for your hard work. The illustration’s​ as good as the first volume. It gave me a paradox feeling. How should I put it? It makes me moved and sad at the same time. It is good for Yuna and Asyut, somehow if I’m thinking about Celiastina’s circumstances right now makes my heart crushed. Aw, you’re welcome! And as always thanks for your comments! 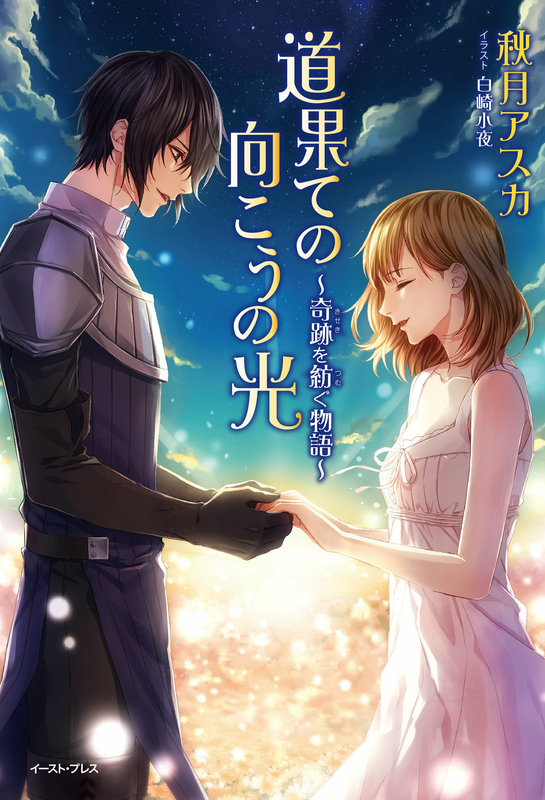 I’m glad you think so since they switched to a new illustrator for the last book n_n Asyut looks much older in this style but the cover is so lovely. Everyone in this series still has one more final hurdle to overcome before we reach the end ;D.
Nope, that’s just a stylistic thing I decided to do! I changed their knight titles to “Ser” a while back because I didn’t like how modern “Sir” looked |D;; so it’d be Ser Aeneas or Ser Siegcrest for anyone talking about them. Ehehe, I was trying to keep from showing the 4th book’s cover until now because of how spoilerific it was :’D but now the cat’s out of the bag! AND YES I love how focused his eyes are on Yuna!! Honestly, these two make me tear up so much. Ahaha, Roblin has some serious concerns though–! !